This past December, budding journalists Morgan Hartley (A.B. 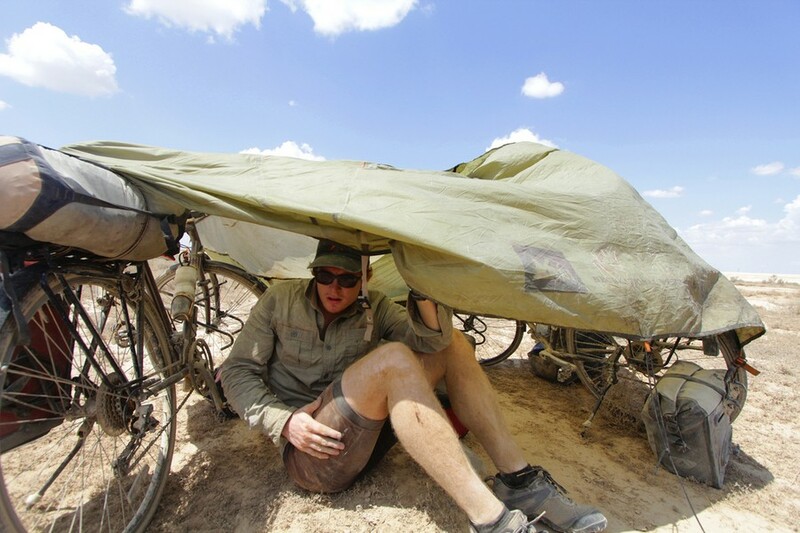 ’11) and Chris Walker completed a two-year bicycle trip from Paris to Shanghai. During their trip, they contributed feature stories to *Forbes* and *The Atlantic* online, and wrote about their own experiences on their website, *Postulate One*. The pair had numerous adventures during their 12,000 mile route that led them through 22 countries. Hartley, a political science major, sat down with the *Maroon* to discuss his post-grad Eurasian travels. Chicago Maroon: How did *Postulate One* come about? Morgan Hartley: *Postulate One* began here at the University of Chicago. I was finishing up my third year and didn’t really know what I wanted to do next. I had some job offers on the table from various start-ups but the thought of an office was so depressing. So I thought, what else can I do? And then it just hit me. I have no idea where it came from—I wasn’t a bike rider before—but it hit me that I should bike from Paris to Shanghai. I know it sounds strange. I went to a party that night and was telling people about my idea and they were like “Oh dude you should totally do it; that’d be so cool!” and I was like “Okay, let’s do it!” So I called up my buddy Chris and I said, “Hey, I want to bike from Paris to Shanghai and I want you to come with me.” So he flew into Chicago for the weekend and we spent that time hanging out, exploring the city, and I pitched him on the idea. By the time he left he was totally on board. And so it began. We spent the next six months fundraising and then in March, exactly six months later, we were on the road. CM: Why specifically from Paris to Shanghai? MH: I was moving to Paris after college with the sole ambition of being a sushi waiter. I’m French, my family’s French, I speak French, I’m a citizen, so I went to Paris to live with my brother and basically do nothing for three months besides wait sushi and have a great time in the city. Since I was already there I thought that would be an ideal starting point. And I wanted to go to China. It seemed pretty far and a good place to end up. Sometimes it was Beijing, sometimes it was Hong Kong. The actual ending city was totally arbitrary. We literally picked Shanghai because it was the most exotic-sounding place. Paris to Shanghai. It has a nice ring to it. CM: Since you were on the road for two years, how did you travel through the different weather conditions? MH: We were in India and Burma for the first winter, which wasn’t so bad. We caught the very beginning of the next winter as we entered China and that was just really cold. There was nothing we could do. We went from Lanzhou to Kunming, up along the very edge of the Tibetan plateau, and there we just froze. CM: So you didn’t bike a direct route from Paris to Shanghai? MH: No, we took four flights during the trip because of the seasons. We had to fly from Georgia to India because we couldn’t get visas to go through Iran. And we also couldn’t go through central Asia because we would have had to cross the passes, the Hindu Kush and the Pamir mountains, and by the time we got there, it would have been too cold. CM: Do you have a favorite story from this trip? MH: I would say my favorite story to tell is when we were camping on the border of Afghanistan and Tajikistan. I was cooking rice on our camping stove so I was wearing a headlamp. Our campsite was high up on a mountain, overlooking the river and facing a valley. Unbeknownst to me, on the other side of the river around the bend, was a border-crossing bridge and a military checkpoint. The sentries had spotted my head lamp, and since there was a long-standing problem of drug traffickers signaling to each other across the river, they dispatched a platoon to dispel the threat. So I’m trying to cook dinner when all of a sudden we’re surrounded by huge dogs that looked like German shepherds. We were shouting and picking up sticks and rocks to try to chuck at the dogs when out of the dark stormed three Tajikistan soldiers in attack formation with their Kalashnikovs pointed straight at us. When they saw us, they just stopped. They looked into our light and after a second they lowered their Kalashnikovs, put them on safety, and asked us for cigarettes. That’s when we knew we were safe. CM: Can you describe what you called “mini-adventures,” which inspired many of your blog posts? MH: When you travel for two years, you have a lot of downtime, and often you just get bored. There are only so many times I can walk around and look at the ethnic-ness of the people. Yes, it’s cool, they’re doing their thing and it’s interesting, but I’m going to do my own thing. So we had to come up with extreme tourism. We would try and climb the tallest tree we could find or challenge ourselves to bike marathons or find the guy in the city who sold the freshest fish. We came up with these crazy activities because they made travel so much more interesting. Opening up a coffee shop in Uzbekistan was probably the crowning jewel of our mini-adventures. Basically, we walk into this bazaar with our camping stove and start setting up. People start glancing at us and then start freaking out because they want to know what these white guys are doing here. Before we even managed to boil the water, we have a crowd of 60 people. They’re standing on the booths next to us trying to get a better view and eventually people start throwing money over other people’s shoulders. They wanted our coffee; it was a phenomenon. It developed into such a crowd problem that the Uzbek police had to shut the whole thing down and kick us out. It was a pretty fun day. CM: How many cups of coffee were you able to sell? MH: Two. There were 60 people and we had one drip-coffee filter. Chris was essentially doing a stand-up comedy show to the right of me, doing whatever he could to keep the crowd entertained. And I was just standing there making drip coffee. So we only made two before we were kicked out. CM: Did they like it? MH: I have no idea. Right when I handed the cups out, they were just absorbed into the crowd. And then the police came. Then there was a fight, and it was just out of control. CM: Obviously it was a physically grueling trip. How did you prepare for it, since you said didn’t bike extensively before? MH: I was a commuter biker and also a long-distance runner. While [I] was at UChicago, I sometimes ran up to a hundred miles a week, so I was in pretty good shape. While in France, I did a few training rides. But mostly the trip just whipped me in shape. Spending seven hours a day on the bike, after two weeks, you are like a rock. CM: Were there mental challenges that came with sitting on a bike for seven hours? MH: You sort of zone out about that. I daydreamed a lot. I would make sound effects without even noticing it while I was biking, just entertaining myself. After a while your mind just shuts down and you go into robot mode. CM: Speaking of entertainment, how did you get internet access? MH: We had little netbooks and anytime we got to a city, we could find Wi-Fi. It wasn’t always good Wi-Fi, but we could post on our blog and send text messages. CM: Did it help, having the ability to connect to the rest of the world? MH: Absolutely. The blog and the writing were huge. I could not have done this trip if we were just traveling. We only biked half or slightly less than half of the time we were on the trip. The rest of the time we were in one place working on stories. That bidirectional focus was crucial. CM: You met some incredible people on this trip. How did you overcome the language barrier with the locals you interviewed? MH: We normally learned around 50 words of the local language. There are six questions you always have to be able to answer: What’s your name? Where are you from? Where are you going? What’s your religion? Are you married? How old are you? The religion one was probably the least common, depending on which country we were in. So if you can answer those questions, you can make friends everywhere. Also, for example, when we did the story on Muay Thai boxing in Thailand, we hired a translator. CM: Did you have to hire a translator often? MH: We couch surfed a lot, with people who spoke English. We would also just post on our website, “We’re going to be in this location, does anyone want to come help translate? We promise it’ll be interesting and we’ll have a beer afterwards.” And people would just show up and translate. We’d make a lot of friends that way. CM: How did you find stories about people like Chai (a nine-year old Muay Thai boxer)? MH: I’ll walk you through what we did in Thailand because that’s pretty indicative of our process. We started with what we wanted to write about, so we narrowed down our list to three stories. Two were environmental scoops which didn’t come through, so we went to a Muay Thai gym and the trainer told us, “Listen, you’ve got to go to this city called Buriram—it’s the birthplace of Muay Thai.” So we biked for four days and once we got there we started asking around about gyms. Eventually we found a couple and one trainer let us hang out for three days. We lived in the gym during that time and found Chai. There were other characters we could have chosen, but his was the best narrative arc that we found. CM: In one of your articles for *Forbes*, you wrote that the stories you chose chronicled “what people can do when they think outside the box, when they decide to forego business as usual.” You guys had unconventional post-graduation plans; do you identify with the people you wrote about? MH: Totally. I absolutely believe in thinking outside the box, especially with respect to grad school. I am an anti-grad school advocate. Unless you’re clear on what you want to do and you know you need specific certifications and training, I think grad school is unnecessary. And when it comes to journalism, I think grad school is such a waste of money. I have friends who went to journalism school, and I think that I have moved further in my career, just in terms of sheer number of bylines and access to editors and publications, because I went out there and found better stories. CM: Did you accomplish your goal for this trip? Do you think you’re now the journalist you set out to become? MH: It is the beginning of a long career. I think I’m just beginning to grasp the craft of storytelling but none of the mastery. That’s a many, many years’ process, so I’m still a novice. I understand how to put a feature story together. Now I’m at the level where I need to be able to find the perfect characters that make the story sizzle and come to life. I’m still in search of that perfect story. CM: What stories are you drawn to, that you love writing about? MH: I’m drawn to stories that cover issues that people have already heard of. People will hear about a major issue—let’s say call centers in India—that they are familiar with. People know that when you call HP to get your printer fixed, you’re probably going to be talking to someone in India. My job as a journalist, as a longform journalist, is to find a character that has a story so compelling that you are drawn to dive into this underworld, not because you care about the underworld but because you care about this person. So by writing about that person, I can teach you about a new issue. That’s the power of those characters. When we were looking into call centers, the perfect story, the absolute perfect story, would make our reader fall in love with the customer care representative on the other side of the line. If I can find the stories like that, I think I’ll have something very powerful because I can introduce new issues to the public. For example, you are a major company or politician, and you need to convince people of something. Take California, for instance, with its plans for a bullet train. Maybe you need to convince the California public that this bullet train is worth building. You need to find the poster child for that story. Maybe it’s the guy who’s been driving up and down from San Francisco to San Diego four times a week. His story shows that there’s absolutely a need for the train, and this guy’s the perfect client. It would change his life. Then people will want to root for him and support this bullet train. If I can figure out how to deliver those kinds of stories then I have a real business. That’s my long-range view. CM: How do you find that poster boy? MH: That’s the million-dollar question. CM: Do you think you can find those stories here, in Chicago? MH: You can find those stories anywhere. In any room, place, city there’s an infinite number of stories. So yes, you could do this anywhere, but the point is you have to find that story that people already find compelling. CM: What were you involved with on campus, and did those activities help you develop your passion for storytelling and journalism? MH: I was a track runner. My freshmen and sophomore year I ran track. That was basically it. I was a firm believer that this was not where fun goes to die, so I definitely had a lot of fun while I was here. My love of storytelling really developed over the last two and half years. It was something that I didn’t completely understand before I left, but the trip honed my passion for it. CM: Are there any more bicycle trips in your future? MH: No, but I do have one more dream, and I’m going to say dream because it’s not at all in the works. I would like to walk from Ghana across sub-Saharan Africa to Mozambique. I don’t know if that will happen or not, but it’s a dream and I’m going to keep dreaming it. CM: Are there any other places that you haven’t visited yet that you want to? MH: Really everywhere in the world, because everywhere has something interesting to offer. I would say that the novelty of travel for the sake of travel has worn off for me. Going to a new place doesn’t inherently hold any excitement. It’s cool, but it’s fun if there’s a challenge associated with it. Not just physical, but also mental, like trying to draw a story out of the place’s relation to the rest of the world. I definitely love to travel. I’m a total addict and I’ll be doing it for a very long time. CM: On that note, what are your plans for the future? MH: I’m going to New Delhi at the end of the month, where I will spend anywhere between three months to a year. There are some fellowships that I’m interested in pursuing. I might also just freelance, spending a few months writing stories there before coming back to do fellowships in the US. We’ll see how it goes. CM: Are there any stories in New Delhi that you’re looking to pursue? MH: One story that I’m really interested in is a story on hijras, transgenders. I closely befriended a transgender in New Delhi and I want to find her and find out what happened to her and write a better story than I did last time. It’s a very powerful story and I don’t think I nailed it because it had more depth. I want to go back and write the perfect story of the woman who crossed the boundaries from man to woman. There are a lot of rites associated with that transition because they live in a very superstitious world. I’m looking forward to diving back into that.